Topeka Zoo's September Conservation Conversation featured Asian Elephant Support as presented by President Linda Reifschneider. Asian Elephant Support is fortunate to have Topeka Zoo as a partner that is mutually concerned about Asian elephants regarding their care today and the future of the species tomorrow. September 13th was the second time Linda has spoken at a Topeka Zoo Conservation Conversation evening. She has visited the zoo several times in the past few years and considers keepers and staff good friends and, of course, always spends some time with the elephants. The 12th, while preparing to drive to Topeka, Linda learned that Topeka Zoo had to say goodbye to Sunda that morning. Sunda was 58, and had been experiencing age-related health issues. That Monday when she woke, she wasn’t able to get up by herself and the fire department brought in a crane that was able to help her back on her feet. Linda understood her health was failing but you always want to think, “I want to see her one more time” and never, “It will be too late…”. All of us at AES offer our sincere condolences to the keepers, staff, volunteers/docents, and Topeka’s public. Sunda came to Topeka when she was 6-years-old and lived her entire life there. Ten years after her arrival, African elephant Tembo arrived and those two lived together for 42 years. Being able to view an Asian and African elephant together is such a wonderful educational opportunity: yes, both are elephants and so much the same, and yet so different. Tembo, African, and Cora, Asian, will continue to offer their visitors this same educational opportunity, but there will be a void in the yard, and Tembo and Cora are having to work their way through Sunda’s passing just as her two-legged family is doing. And so, in spite of such circumstances, Topeka Zoo and the Topeka Zoo community welcomed Linda warmly. We shared a moment focused on Sunda, and then had our conservation conversation: discussing the many challenges facing Asian elephants as they make their perilous trek to the next century, as well as the ways AES both alone and in collaboration with other nonprofits are hoping to smooth out some of the bumps, and thus enable the Big Ones to make that journey successfully. Thank you Dennis, Wrylie, docents and volunteers for making Linda’s visit a good one, even though all our hearts were very heavy. And to Kim, Elise, Joe, Robyn – thank you for all you do for all Topeka’s elephants. May the joy of your memories of Sunda ease the sorrow of her passing; know that your dedication to all elephants will only grow because of knowing her. Once again this past August, Linda headed to Oregon and Washington – to visit some great two and four-legged friends and celebrate World Elephant Day. First stop is Portland, Oregon, where Ann Littlewood, once a zookeeper and now an author (Linda’s favorite: Did Not Survive) invited us to stay with her and hubby, as well as visiting aunt and niece. A lovely home with some very good conversations definitely added a special joy to this visit. At the Oregon Zoo, Shawn Finnell brought Linda up to date on their elephants as we watched them. And it was good to see Samson settling in so well at his ‘new digs’. Saw him three years ago when he was contributing to the Albuquerque Zoo’s breeding program. Now he’s moved north to work his magic! Point Defiance, Washington, is always a favorite stop. John Houck, deputy director, is preparing to don the new cap of ‘retirement’ (that definitely doesn’t mean ‘does nothing!’ – not with individuals of John’s ilk). 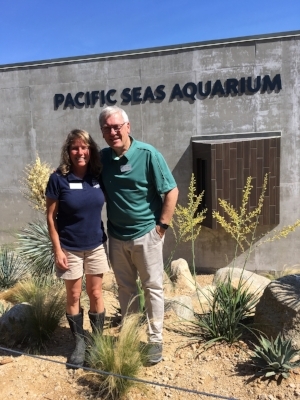 On Linda’s visit he gave her a tour of their to-open-in-September new aquarium. It will be a truly wonderful experience for all who visit Point Defiance Zoo. Linda, of course, always stops to say hello to Hanako and Suki, as well as Shannon Smith and the rest of the elephant barn staff. Andy, Margaret, and Russell joined us for lunch. Like so many busy elephant keepers, these folks also make time for our visits and always make visits so very warm and welcomed. And best to you, John, as you find out how darn busy it is possible to be when one retires! Shannon and John Woodland Park Zoo’s invitation to participate in their Wild Asia Festival is the impetus for this trip. WPZ has been supporting Dr. Christopher Stremme’s work in Sumatra for several years and we are always delighted to visit and share an update of Dr. Stremme and AES’ work on behalf of Asian elephants. It is also especially nice to accept this invitation as WPZ has helped us, not only by funding Dr. Stremme, but also by hosting a CPK event for us. Bobbi Miller, Field Conservation Coordinator, has become a special friend over the passing years as we shoulder on for Asian elephants. On Friday, Linda gave an update at a lunchtime talk and Saturday she had a table during the Wild Asia Festival to talk about AES’ efforts in Asian range countries. The Pacific Northwest is awesome… but it’s not just the scenery. For AES, it is the many warm, wonderful, capable, and dedicated staff at these three zoos. We are fortunate to have such people on the side of the Asian elephant, helping this magnificent species make its difficult trek to the next century. Thank you friends! This past June Turk and Vanessa headed up to St. Louis to meet Barb and Linda for the 2018 Annual AES Board Meeting. Vanessa and Turk spent that Friday, June 8th, at the Cahokia mounds in Illinois and the City Museum in downtown STL to celebrate Vanessa's birthday. Then we held AES meetings both Saturday and Sunday to plan out our next year's worth of activities and fundraisers. Saturday night we were lucky to have a nice dinner planned at a local pub where we all visited with keepers and docents from Grant's Farm and St. Louis Zoo. Vanessa and Turk visited the STL Zoo Sunday and enjoyed meeting up with their elephant keepers for a special training demonstration with Rajah on exhibit. That Monday, Turk and Vanessa headed home and stopped at Dickerson Park Zoo in Springfield, MO to see their elephant program and meet their keepers. We look forward to sharing all of these exciting new ideas in the coming months with you. Thank you for your continued support and helping us help elephants. Thailand is the country where Linda first landed in her quest to see Asian elephants on their home turf. Over the years, many good relationships and programs have offered the opportunity for AES to collaborate and support efforts benefiting both Asian elephants and the people who care for and about them. Chiang Mai, one of the northern Thailand tourist destinations, is a good base on visits. Long-time friend, Julia Ferdinand, domiciled here, is always good logistics support and the all important ‘wheels’. So, too, this trip. Our first stop is a long drive for a brief, but very good visit, to catch up with John Roberts at The Golden Triangle Asian Elephant Foundation (GTAEF) base at the Anantara Resort, near the Golden Triangle. Through GTAEF, John offers an excellent and flexible elephant experience opportunity for tourists, while also always alert for programs and efforts to help improve captive elephant care where needed, as well as responding to requests for funding for educational, rescue, and other worthwhile efforts. AES has collaborated with GTAEF on a few occasions and looks forward to doing more together in the future. The following day we visit the University of Chiang Mai’s Veterinary School. Linda is fortunate to know a few of the staff from our conferences and workshops, and she knows the effort they are making toward advances in elephant health care but had never before visited. After a very good meeting with Drs. Chatchote Thitaram and Chaleamchat Somgird, Dr. Khajohnpat Boonpraseet (“Dr. Yeaw”) takes Linda to Patara Elephant Farm. Linda visited there 10+ years ago when Patara had 4 or 5 well-cared for elephants and great sounding plans. They almost sounded impossible! But, 2018, and Theerapat (“Pat”) Trungprekan has more than delivered on this promise. Now 57 elephants strong, with three calves born last year and five expected births this year, Patara is helping to stabilize the Thai elephant population. At the same time, a great tourist opportunity is offered. Staff is kind and friendly and both know and respect the animals under their care. Linda saw a comment on a tourist industry website that said, “If your trip to Thailand includes one day in Chiang Mai, spend it here. If not, add a day and spend it here,” and thinks that is some pretty good advice! The next day, Linda rode along as Dr. Yeaw visited several elephant camps to treat elephants; mostly he is drawing blood to examine the cycling of selected females. First stop is Maetaman Camp. Over the years, Linda has been here many times. At present, they have 60+ elephants, some owned by camp owner, some are owned by others and brought here to work. Dr. Yeaw does 11 blood draws, all to check the cycles of these breeding-age females. The work goes smoothly with all but one elephant waiting her turn quietly and all cooperating like real pros. The one exception squeaked when she felt the needle but otherwise was a good girl. Maybe she’s new to the program! All elephants seen were between their late teens and into their 40s. 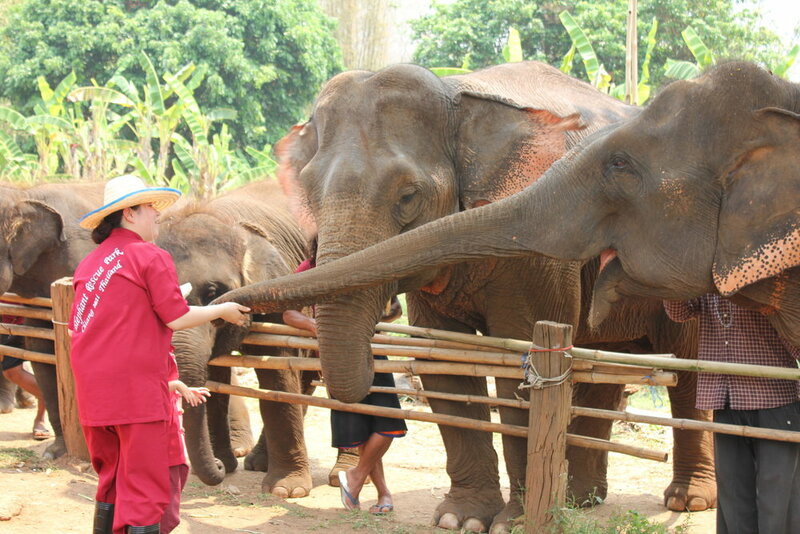 Next, we visit Rimtan Elephant Camp, a small camp with just a few elephants and did one blood draw. A bit farther we stopped at Elephant Carer Home: no draws, no elephants in sight. Just a visit to ‘check in’ and be sure all is good. Then a visit to Elephant Rescue Home where we see 5 elephants: 2 adults and 3 juveniles. Give a tetanus inoculation to one elephant and looked at an inflamed eye on another. Last stop is Baanchang Elephant Park. Met the woman owner to treat a female elephant who is bossy and a fighter but picked the wrong gal for her last battle, and besides lots of skinned up places, has a horribly swollen front leg Dr. Yeaw is treating. They have 54 elephants there and the facilities are quite new, well laid out, decently designed, and look like good materials and construction. 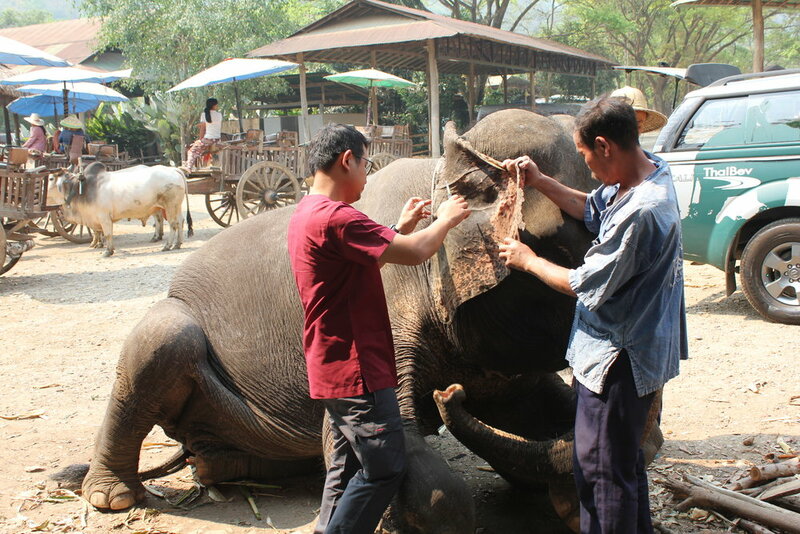 And, these elephants get preventative medicine and have veterinarians on the premise. No visit to Chiang Mai would be complete without a day trip to Lampang to visit with Richard Lair. An American who has been working in Thailand for more decades than we care to admit at this point, he is a true authority on not only the Asian elephant in Thailand and other Asian countries, but also the Thai history, culture, and language. We are proud he is an AES adviser. The last day in Chiang Mai concluded with Dr. Yeaw and Pat, owner of Patera, and Linda at dinner. It was an excellent meeting and Linda agreed to help the newly forming Thailand Elephant Alliance (the owners of working elephants) which is being set up to both improve camps where needed and to educate the public on good elephant husbandry as well as the history and culture of Thai elephants and their owners/mahouts. Not sure how she/AES can be of assistance, but we are eager to help where possible. After six days based in Chiang Mai, a last visit to Ayutthaya and the Elephantstay program at the Royal Kraal. Linda always has a horrible time getting tuk-tuk drivers to get her to the right destination. Finally, Ewa and Michelle explain to her it’s her pronunciation – comes out not meaning anything to the driver (who evidently isn’t good at 20 Questions, but sure tries!). It was a short visit, but a good time watching the bulls delivering fodder to the ‘elderly ladies’ in the Elephantstay program and the antics of two young calves. Personal note from Linda: I always return from any trip to Asia more convinced than ever that Asian Elephant Support has it right. Concentrating our funding in Asia is without a doubt the best investment we – and our donors – can make. Lots of challenges ahead to get these magnificent animals into the next century, but if we look at ‘challenges’ as opportunities for us to put our commitment and resources toward – and with the support and encouragement of you, our donors and friends – we are confident we can be an important contributor to this effort. Thank YOU – for helping us help elephants. In July we will commence a campaign to provide The Center for Excellence in Elephant Research and Education a second vehicle. Stay tuned!